“Do I have to tell my employer if I am planning to take industrial action? However, once action has begun, you should respond truthfully if your manager or a person in authority within the institution asks you if you participated in or are continuing to participate in industrial action." 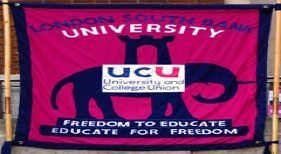 We are staging a protest lobby on Tuesday 15th May 9am outside main entrance to Technopark, London Road to support the UCU negotiators who are meeting the VC/ management to discuss our lodging of a collective dispute. Please come along to support us! that UNISON members voted unanimously to reject any compulsory redundancies at the UNISON branch meeting held on 16th May 2018.
it is through joint and coordinated action between the three recognised trade unions at LSBU – UNISON, UCU and GMB – that our jobs, health, and the quality of education and support expected by our students can be protected. To demand an audit of earlier restructurings, eg. of marketing in 2017, of the IBM contract, and of abortive LSBU property and campus development activities, including their costs over the last five years. That there should be a genuine estimate of teaching hours (scheduled contact and teaching related); crucially, the scheduled teaching (within SBA definitions) is <360h for most staff (1Sh x 24 weeks) so, if they refuse to do other activities on campus (which some do), the student experience is very poor from those tutors. We support an estimate and discussion of workload, but we would not wish to move to a bean­ counting model that undermines academic freedom or fails to appreciate disciplinary differences. The corollary to the SBA's 36 teaching weeks (and no more than 72 evenings p.a., which is now obsolete for most courses) is a reasonable expectation that staff will usually be present during the week for the 24 weeks of the 2 semesters, and available during the revision weeks. Self-directed scholarly activities should be discussed and agreed with the line manager; they should be of benefit to LSBU and to the academic, and should generate tangible outputs or improvements. We are willing to leave the generous 10 weeks of holiday in place (35 days + 5 discretionary days + ea 2 weeks of national holidays/University closure). Given b) above, and the fact that there are crucial activities taking place all year, we would expect all staff to offer to support some evening and weekend events, receiving overtime pay only if they already had a full workload. NO attendance at exam boards - or anything else academics may normally do for the duration of the action. Staff were recently invited to provide feedback regarding how the university is being run. Since UCU represents both academic and associated staff we believe it our responsibility to register our concerns and misgivings at the current direction of travel on which the university has embarked. At the start of your incumbency UCU members believed that you and your Executive Team marked a substantive shift away from the managerialist top-down regime that you replaced. After the regime of the previous Vice Chancellor, academic staff were left demoralised feeling professionally undermined and undervalued. There were promising indications of a return to a more open and collegial management style for the running of the university, one befitting the character of the Academy and its scholarly and professional staff body. It is becoming increasingly apparent with each passing month that the managerialist behaviour you are demonstrating confirms staff fears that your approach is but a continuation of the same style of industrial relations that was so damaging to this academic institution under the previous Executive. What staff are witnessing in all areas of LSBU now is management by diktat. Rather than negotiating with UCU over a number of fundamental aspects of our terms and conditions, your preferred approach is the imposition of solutions while hiding behind the legal and statutory minimum and what you call the 'student experience'. Legal requirements may be a starting point for good industrial relations but cannot entirely be effective without a genuine willingness on the part of management to engage in meaningful negotiations with staff and their unions that can produce a satisfactory agreement. Good industrial relations are key to a successful university and in order for a positive student experience to be provided staff must be on board with the strategy and included at all stages of its trajectory. We are all committed to improving the effectiveness of our professional practice, pedagogy, research and enterprise. However UCU does not accept that this is or can be achievable if the behaviours that the Executive Team has been exhibiting in recent months were to continue. We are witnessing a dangerous deterioration in staff morale, which may seriously damage staff motivation and impact on the student experience. Imposing new grade descriptors and a new cheaper GTA grade that poses a threat to the pay and conditions of all academic staff. The intention to worsen our terms and conditions of work as set out in the proposed changes to the South Bank Agreement. The action you took regarding overtime pay encapsulates the poor industrial relations at LSBU. Your decision unilaterally to dispense with this important contractual obligation, without any negotiation or discussion, was only reversed when UCU called on members to refuse to cooperate. Many staff are fearful that their employment conditions are going to be significantly damaged and UCU must defend these as incorporated in the South Bank Agreement. Reorganising the administrative and support services within the university without consulting academic staff. This has also had a negative impact on the administrative and support staff. The questionable grounds on which a decision was made to close the Bioscience courses and the shoddy treatment of the Bioscience staff demonstrates a lack of regard for the livelihoods of those who work at LSBU. Dissatisfaction with the system to resolve staff complaints. Numerous issues have been raised by staff to do with discrimination, institutional bullying and unfair treatment. Rarely if ever are staff grievances resolved favourably. There is now a lack of confidence among staff that they can get fair treatment from the university. UCU is in the middle of the most important negotiations for sixteen years. This involves the new grade descriptors for Grades 7 & 8 and the London South Bank Agreement (your contract). This will affect your workload, the quality of educational provision, your stress and health and your work-life balance. Although some progress has been made in negotiations over these Grade Descriptors the management are threatening to impose them and thus circumvent and undermine the current negotiations on the South Bank Agreement. UCU has instructed members not to acknowledge, recognise or operate these Descriptors until negotiations are completed and the whole package can be put to you for your approval or rejection. It is vital that all members follow our advice. Management appear to have broken off negotiations by seeking support from their lawyers to say that not doing what they demand is illegal. No doubt their lawyers will come up with the necessary ‘advice’. Our instruction to you is NOT industrial action but the maintenance of the status quo until negotiations are completed. We are simply making sure that we continue to work as usual. Management are seeking to use the law to force you to implement part of the negotiations and circumvent the full process. If they continue to threaten you in this way instead of continuing negotiations they reveal an agenda of imposing new terms and conditions on all of us. This is not acceptable. UCU Co-Comm will be seeking your support for our negotiating position. We call on all members to stand together and not be intimidated by management waving their legal ‘big stick’. You will have received a communication late this afternoon from the Deputy Vice Chancellor, Pat Bailey, accusing UCU of being unwilling to take part in negotiations on the South Bank Agreement unless the consultation of the Academic Framework is reopened. UCU is not seeking to reopen consultation on the Academic Framework. Lest there be any doubt as to UCU's position we attach the letter that was sent to Mandy Eddolls, Executive Director of OD & HR early this morning, long before Pat Bailey's communication. We draw your attention to point 1. on page 2 of this letter: " UCU has rejected grade 6 and has ‘parked’ agreement on 7 & 8 pending completion of negotiations on the LSBA." Nowhere in this letter is there any suggestion of reopening negotiations on the Academic Framework. This branch rejects any attempt to introduce the Grade 6 (GTA) role as currently presented by LSBU management. We consider it an attempt to undermine the pay and conditions of academic staff. This branch instructs members not to recognise or operate under the proposed Grade 7 and 8 descriptors (for example through the Appraisal scheme) until negotiations on the new South Bank Agreement are completed and endorsed in a members’ branch meeting and ballot. 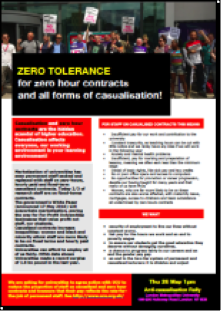 We call on LSBU management to continue negotiations on the new contract and recognise our grievances over the existing contract: a) Lack of transparency and fair treatment in the application of tariffs in different Schools b) Tendency to pressure staff into working more than 15 hours per week of Scheduled Teaching Activities. We call on LSBU management to provide full information to UCU on the working of the current contract a) Weekly (actual not average) Scheduled Teaching Activity for all staff, and b) The tariff for STA reductions currently applied across the University, where these have not already been supplied. We call on LSBU management to provide full information and explanation of the proposed ‘Academic Teaching Year’ and ‘Holiday Leave Year’ and working week for all staff. 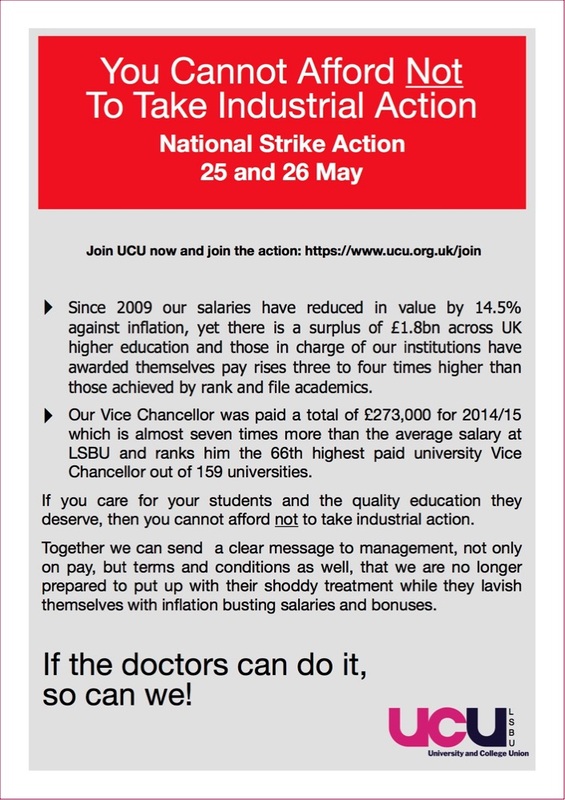 Nationally, UCU is asking members to send a clear message to those who represent our university managements that hard working Academic Staff are not prepared to accept Management’s latest derisory offer, which effectively represents a further cut in salaries. It is precisely because as academic staff we are always focused on delivering the best we can for our students that we expect to be adequately remunerated for doing so. Along with doctors, nurses and other public sector workers, we enjoy the confidence and support of both the public and students throughout the country. Our students know that we do not take industrial action lightly and, if we do take it, it forms part of the broader fight to defend their public university and resist the increasingly damaging casualisation and marketisation of the HE sector. Crucially, it is academic staff at the chalk face who most clearly represent the ‘university student experience’ for most LSBU students, yet time after time it is we committed academics who are expected to accept the continual erosion of our pay and conditions, while that small minority of senior managers appear most preoccupied with maximising their remuneration, while naturally reminding us with their 1% pay offer how ‘we’re all in it together’. 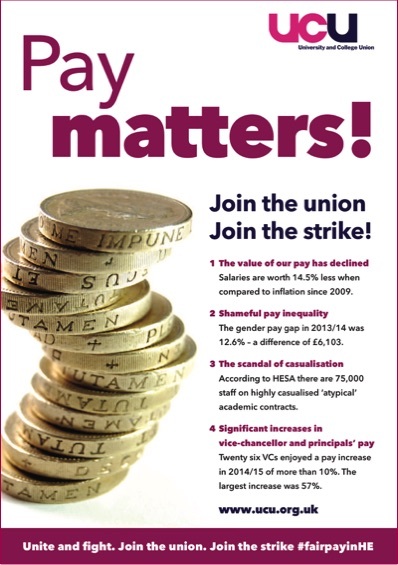 Not only is a 5% pay rise a realistic and credible pay claim it is also affordable. What is no longer realistic and affordable is the grotesque earnings gap between the top management and the rest of us. Our Vice Chancellor was paid a total of £273,000 for 2014/15 which is almost seven times more than the average salary at LSBU and ranks him the 66th highest paid university Vice Chancellor out of 159 universities. With plummeting staff morale throughout LSBU, the University finds itself led by a VC who has moved from ‘listening’ mode to that of near total detachment. There is a tangible air of denial regarding the debacle being presided over as warned in the open letter UCU sent the VC last December drawing his attention to the pressing question of dreadful morale, among other matters. Furthermore, instead of opening a meaningful dialogue with those charged with delivering the restructuring project he initiated on his arrival, he and his SMT have gone down the road of attacking our pay and conditions, while cynically paying themselves bonuses! Indeed, the lack of transparency over the awarding of these very bonuses begs the question: what exactly has been achieved for the University by senior management in order to merit them? While senior university managements the length and breadth of this country decide their pay and conditions in secrecy then vote themselves eye-watering salaries, not to mention year-on-year, 3% plus pay increases, all further boosted by bonuses and lavish pension arrangements, academic staff receive mealy-mouthed, lectures from management about the unreasonableness of our pay claim, which at 5% still falls well short of our 14.5% loss in earnings since 2009. 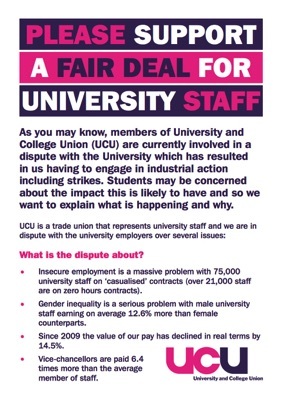 What UCU has learned is what employer representatives have known all along. Unless you have a credible threat to use as leverage in negotiations you achieve nothing but continuous cuts in earnings and worsening conditions. A demonstration of resolve to reverse this damaging trend through industrial action that disrupts the management’s business, and makes it difficult for them to justify their exorbitant salaries and bonuses, is what is urgently required. What is the total cost of senior managers to the University? What have been the total financial costs and percentage increase on their salaries since 2009? What did they get bonuses for? Who decided who should get a bonus? How much has been spent on the restructuring of LSBU since Professor Phoenix took office? How much has been paid out to IBM to redesign LSBU’s IT systems? How much is spent by Executive Team members and Deans on air and rail travel and what is the class of travel? How much is spent by Executive Team members and Deans on hotel and other accommodation and what is the class of that accommodation? End the Gender Pay Gap Now! In addition to the gender pay gap, UCU is outraged by the grotesque pay gap between ordinary staff and senior management. While Academic Staff have been offered a measly 1.1% pay rise university leaders, mimicking fat cat CEOs of Footsie (FTSE) companies, have awarded themselves an average pay increase of 6.1%. Our own Vice Chancellor was paid a total of £273,000 for 2014/15 which is almost seven times more than the average salary at LSBU and ranks the 66th highest paid university Vice Chancellor out of 159 universities. 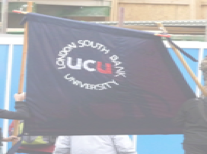 UCU does not sanction strike action lightly. The current state of affairs is clearly unacceptable and we are in this to win. As if our ever diminishing pay is not sufficient cause for low morale (our salaries have reduced in value by 14.5% against inflation since 2009) there is also a drive to worsen our conditions and threaten our jobs by bringing in lower paid Graduate Teaching Assistants and zero hours contracted staff. Despite this growing pressure to defend our conditions of work, UCU reps continue to selflessly give up their time to stand by members, supporting them throughout the ever increasing number of disciplinary and grievance proceedings. However, we cannot stand by members and support them if members will not stand by their Union and support their colleagues in one of the most important issues of all - industrial action. 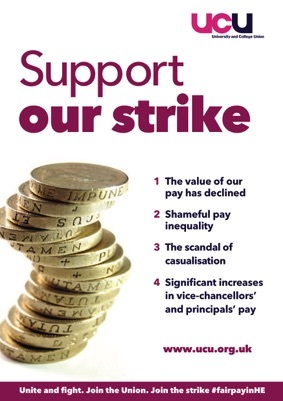 This is an official UCU strike and all members are instructed to take strike action. Any member who breaches this instruction, thereby undermining UCU’s efforts to defend members’ interests and pay, will be asked to explain this breach to the Coordinating Committee. If no satisfactory reason is provided the Coordinating Committee may be unable or unwilling to provide local support or case work advice. Students support us. They know we do not take industrial action lightly, and therefore, when we do so we take action as part of that broader struggle to defend their public university. Indeed, resisting the increasingly damaging casualisation and marketisation of the HE sector is central to the campaign against the totally unjustifiable increase in student fees. The National Union of Students (NUS) has come out in support of our industrial action because they know that it is the academic staff at the chalk face who most clearly represent the ‘university student experience’ for most LSBU students. In the interests of Staff and Students we committed academics can no longer accept the continual erosion of our pay and conditions. UCU ‘s response can be viewed here. On 16 August UCU received a more detailed response to the document we submitted. There are parts of this response that remain unclear. With negotiations resuming on Thursday we will further inform members, once we have clarification of what precisely management objections are, and what UCU’s position is with regard to them. There will we a branch meeting on 4 October where we will discuss the branch position on these negotiations further. Details of this meeting will be sent out separately.